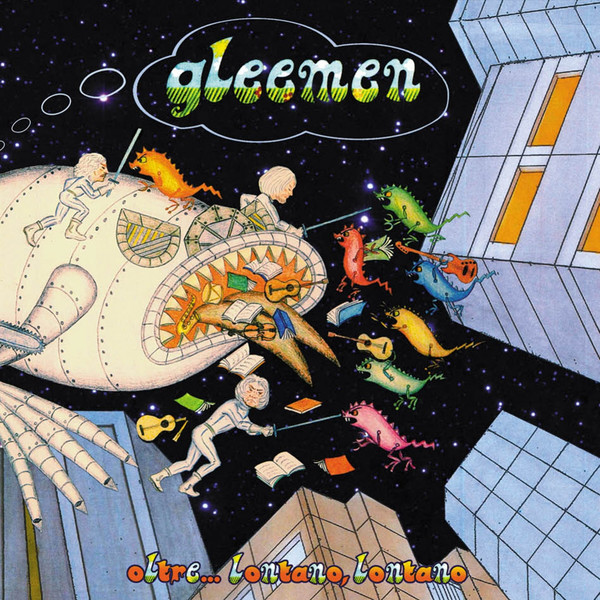 The history of the Gleemen goes all the way back to 1965 when guitarist Bambi Fossati got together with Maurizio Cassinelli (drums), Angelo Traverso (bass), and Marco Zoccheddu (guitarist who went on to Nuova Idea) to form the Gleemen. In 1970 they released their only album. The Gleemen morphed into Garybaldi in 1971. Over the years the original band members have remained musically active through a number of projects and then in 2013 Maurizio and Angelo revived the Gleemen to record and release their second album Oltre... Lontano, Lontano. They enlisted Bambi and Marco to complete the original lineup, plus added several younger musicians: Giampaolo Casu (guitars), Giovanni Pastorino (keyboards), and Mauro Culotta (guitars). To augment their sound, they brought in a bunch of guest musicians: Martin Grice (sax), Pino Nastasi (vocals and bass), Danila Piras (flute), Alessandro Paolini (acoustic bass), Roberto Piga (violin), Fabrizio Nuovilibri (bass), Carlo Olivieri (drums), and Luciano Ottonello (electric guitar). The result is an interesting mix of 70s blues rock and Italian progressive. In his youth Bambi was enamored with Jimi Hendrix and this current disc still shows the influence, especially on the outstanding “Schizoid Blues.” There are ten songs on this disc and the chosen running order is interesting. The first half is pretty straightforward 70s blues rock and Italian progressive. Then the remainder of the disc assumes a more acoustic atmosphere with some very pleasant songs that come very close to pop rock. The title track closes the disc with music very different from the other nine. There is some kind of Zydeco/Cajun vibe along with the Outlaw Country of Waylon, Willie, and the boys, as well as a bit of Tex Mex thrown in; all in all a pretty cool track. The disc shows that this song is 10:24 but it is over at the 7:04 mark. There is silence for about 30 seconds and then a different song fills in the remaining time. This is a pet peeve of mine. Why not make it a stand-alone song and credit it properly? Nevertheless, this hidden track is acoustic guitar and vocals calling to mind Le Orme. Overall, Oltre... is quite a good release for a second album after 40+ years, despite the cheezy cover art.